Elderly Lord St. Blaizey is that classic figure of detective fiction; a man who has quarrelled with his crippled son and heir, fired his private secretary, alienated his wife Helen and his daughter-in-law, and seemingly everyone else in his life, and then dies in mysterious circumstances after falling from his horse. It soon proves to have been murder by person or persons unknown; Dr. Benjamin Tancred, consulting detective, and his friend Paul Graham, the narrator, who have known the family for years, take a hand in the investigation at the request of elderly lunatic Sarah Pendexter. Sarah has had a dream that her brother’s murder was committed by her nephew Rupert, and when Rupert turns out to be the surprise beneficiary of Lord St. Blaizey’s estate, thanks to a suspicious codicil added to the will, it may be that Sarah is not as lunatic at all that. Dr. Tancred talks to the suspects and investigates until the circumstances surrounding a second murder, that of the fired private secretary, makes things more clear to the detective team. At this point it’s more a howdunit than a whodunit and finally Dr. Tancred finds a way to assign the guilt to its proper quarters. Frankly, this book just about isn’t worth your time. 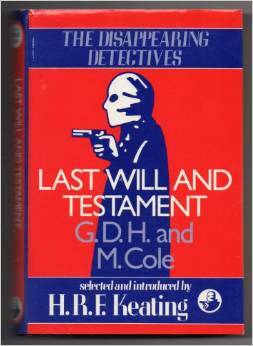 The Coles’s detective novels are very, very hard to get these days, and I can’t say I have read more than a handful of the 34 volumes. Certainly these authors are literate and intelligent writers. This book is competent, for the most part. The flow of the novel is even and assured, and the writing occasionally moves above the pedestrian level to wit and even elegance. The language is fine, and the background milieu of rural Cornwall is delightful (and the authors obviously know whereof they speak). But of all the novels of the Coles I’ve read, this is certainly the worst introduction. There are a number of problems from which this book suffers; one of the most annoying is that this is actually a continuation of an earlier story which formed the introduction of Dr. Tancred, unsurprisingly named Dr. Tancred Begins. Helen Pendexter’s father’s murder formed the basis of that case and both Dr. Tancred and his Watson pretty much fell in love with Helen in the process. Some twenty-five years later (in fictional terms; that volume’s publication predates this one by only a year) we find that Helen has married Lord St. Blaizey’s only son, who was crippled by a tiger while on an anthropological expedition in Africa. I haven’t read the first volume, but it makes me wonder how a young woman whose personality endeared her to the protagonist in volume 1 can change sufficiently by volume 2 to display some pretty unpleasant behaviour. If you actually have managed to read volume 1, you will have problems with volume 2. The publishers (and H.R.F. Keating in his introduction to the “Disappearing Detectives” edition pictured nearby) insist that no knowledge of the previous volume is necessary. I’m suggesting it might actually be counterproductive, and that’s a BIG problem for a mystery. I can’t say that it’s especially terrible that the characters in this novel are two-dimensional and unrealistic. That was the fashion of the times and I believe the connoisseurs of the time would have found any attempt at realistic characterization to be not in the best interests of the mystery. But there is a big issue with the characterization. There are two characters in this novel who are, indeed caricatures of reality, just like the rest. But the authors have used these two characters in a very regrettable way. One is Sarah Pendexter who is so nutty that these days she would invite medication and hospital-based restraint; she provides “information” which she admits is from her “visions” of things that have happened. The other is a homeless man (what was then known as a “tramp”) who provides crucial information but who is, I’ll put it mildly, not a reliable informant. My issue is that these unrealistic characters are constrained to act in irrational ways because the only way in which the plot can be moved forward is by irrational action. To kick off the action of the novel, Sarah has such a violent hatred for her nephew that she tries to hire Dr. Tancred, pretty much, to frame him for murder. And the tramp lies about events for no reason at all, except that it extends the plot by a few chapters while Dr. Tancred traces the lie back to its source. If your plot is so poorly constructed that you have to invent weird characters to make them reasonable, that’s another big problem. Still more problematic is that the authors put crucial information into unreliable mouths; not only is that a tired old trick even in 1936, but it forces the reader to wade through acres of unpleasant craziness to glean the kernel of truth. And the reader does, because we have seen so many times that a character who admits to telling lies is always telling the truth about something that seems improbable. Dr. Tancred and his dogsbody are colourless doofuses who are so incompetent that we learn about 3/4 of the way through the book that they have misunderstood a fairly important fact about the crime. And again, the only reason for this misunderstanding is that it pads out the novel; their error is caused by not having asked anyone to confirm an assumption Dr. Tancred made. It also seems clear that delaying the action is the function of the second murder. I started to think as I neared the end that this may well have started life as a short story. There’s just not enough story here to fill a novel. To sum up: the writing is good, the plotting is contrived, the characterization is dire, the background is interesting, and the mystery is undemanding. I know the Coles have better mysteries because I’ve read some; I recommend that you find one. G.D.H. and Margaret Cole are only minor figures in the history of Golden Age Detection, but they are first-rate second-rate writers, if you follow me, and you should have at least a glancing idea of what they’re about. They certainly influenced more memorable writers. I’ve illustrated every cover variant I found for this book, including a couple that I’ve never seen or held. 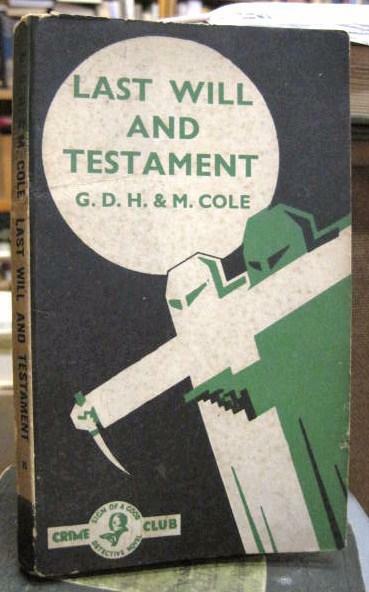 The volume to the left, an early example of the trademark “green ghost” cover art from Collins Crime Club in England, is a delightful entry in this long series; whenever I see this cover art in a bookstore my heart gladdens, because the series is important and occasionally fine. So this would be my favourite. The jacket for the first edition (at the top of this post) is unfortunately quite drab at a time when Collins was doing wonderful covers for other novels by the Coles; I would have expected something a lot more graphic than this effort. I should mention here that I am indebted to ClassicCrimeFiction.com for the picture of the first edition’s jacket at the top of this post; it’s the only such picture on the entire internet, as near as I could tell, and I have only lifted it from their site because there is no other to show my scholarly readers with a taste for early Crime Club jackets. ClassicCrimeFiction.com is an excellent place to acquire scarce novels such as the present volume, since that is their specialty, and I highly recommend them to your attention. If anyone can get you rare volumes like those of the Coles, they can. This entry was posted in Brand, Detective fiction, Golden Age of Detective Fiction, Mystery, Mystery writers, Quick Looks and tagged Dr. Tancred, G.D.H. and Margaret Cole, G.D.H. Cole, Margaret Cole. I’m actually with Curtis on this one. The Coles are worth reading, just not this one. Unfortunately I’ve been looking most of my life for reading copies and not found many … if you find a reasonably priced copy of any of their books, though, I recommend grabbing it. They really are worth your attention. OK Noah, consider me convinced – thanks chum. I don’t like this one Sergio, so this particular field lies undefended! I’ll forgive Sergio for not remembering that I was probably the first one to review the Coles among the current crop of mystery bloggers. All three posts were back in 2011 and 2012, after all. :^) I’ve read four books by the Coles and three of them were enjoyable and witty examples of the fair play detective novel. Guess I was lucky in my picking. I’m not so keen on the stories found in Mrs Warrender’s Profession, however. If you twist my arm I will concede that “Toys of Death” is worth reading if you find it in an anthology, but you can skip the rest of them in the book. Yes, I’m quite willing to believe I found a dud for my first review of a Coles novel; I remember reading a handful of others and enjoying them. 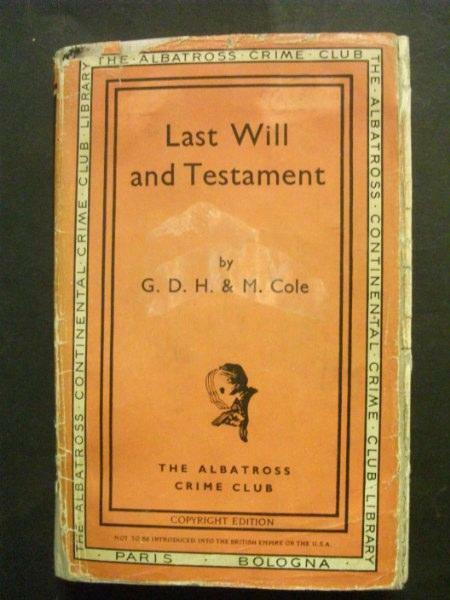 Last Will and Testament is the only one currently on my shelves, though … because they’re so scarce. I’d love to see them reprinted so people could get a really good idea of their range and skills. Hi I have just finished Dr Tancred Begins. It was a most frustrating and tedious read. I completed the book only to find that there is a second one! A search on the internet led me to this site. For information I am Australian and in north Italy on a 3 month holiday. I discovered a fascinating English language library in Alassio Liguria containing thousands of books. Most were donated by English people living as expats in Alassio in the first decades of the 20th century. There are shelves and shelves of thriller and crime novels. It is an extraordinary time warp voluntarily supported by an elderly English woman who married a local man and some other locals. Fortunately the local council provides space for the library in its present location. Worth a trip to Italy to see it! That does sound really amazing. And I expect they could have some really scarce and valuable books there … keep your eyes open for old E.C.R. Lorac novels!